The oils and proteins of the Biohawk blend of Zingiberaceae rhizomes are valued for their ability to replenish skin and to repair damage from the sun. 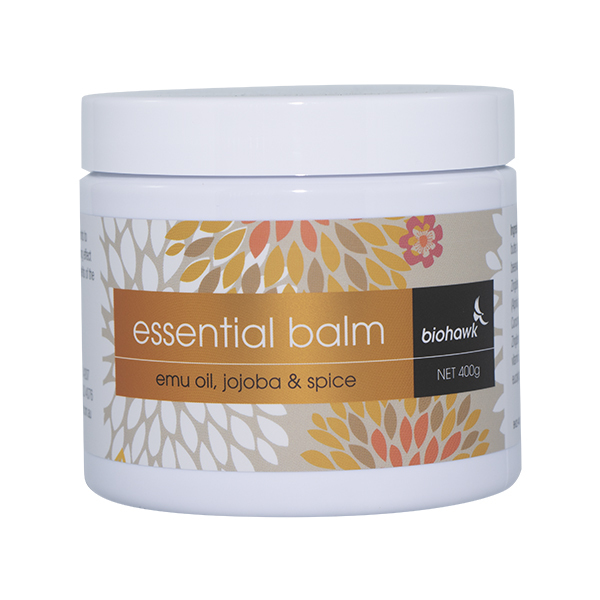 Our products are made from natural plant oils, juices and extracts, with emu oil in Essential Balm for transdermal penetration. 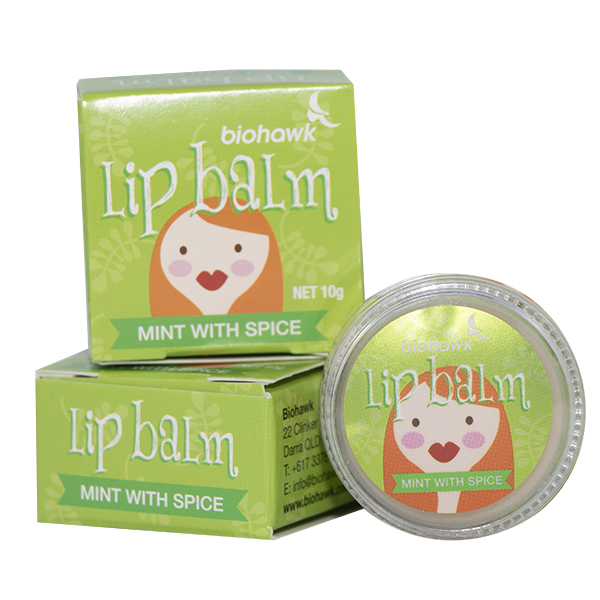 The Biohawk blend of Zingiberaceae ginger spices enriched with the oils of Zingiber officinale (ginger) help to replenish skin and smooth wrinkles. 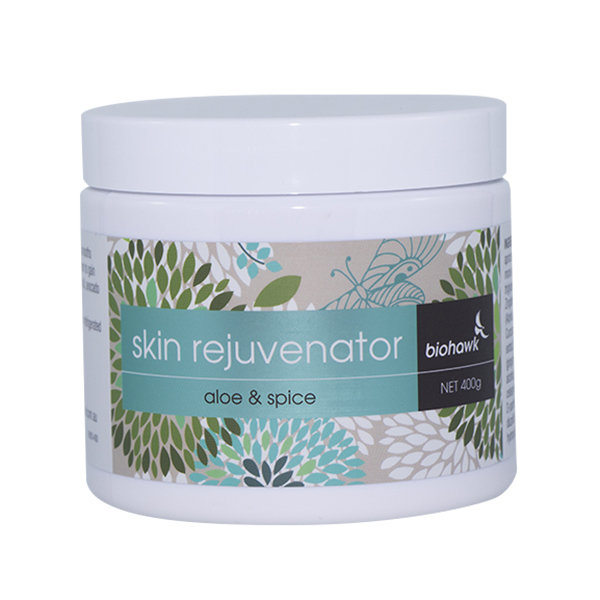 Rejuvenates skin and smoothes wrinkles; use it as a day & night cream to gain benefit from the natural aloe, apricot oil, avocado oil and the special blend of gingers. Ingredients: Aloe vera juice, apricot kernel oil, glyceryl mono-stearate, capric/caprylic triglycerides, dried Zingiberaceae rhizome extract (Alpinia galanga rhizome extract, Curcuma longa (turmeric) root extract, Zingiber officinale (ginger) rhizome extract), cetearyl alcohol, glycerin, avocado oil, cetearyl octanoate, ceteareth-20, D-panthenol, vitamin E, diazolidinylurea, fragrance, methyl hydroxybenzoate, carbomer. Store sealed in a cool dark place or refrigerated to maintain natural activity. Massage into muscles and joints to relieve aches and pains or enjoy the soothing effect of a foot massage and experience the benefits of the natural oils from each component. Ingredients: emu oil, mango butter, shea butter, jojoba oil, beeswax, glycerine, dried Zingiberaceae rhizome extract (Alpinia galangal (galangal), Curcuma longa (turmeric), Zingiber officinale (ginger)), vitamin E oil, peppermint oil, eucalyptus oil, tea tree oil. Store sealed in a cool dark place. 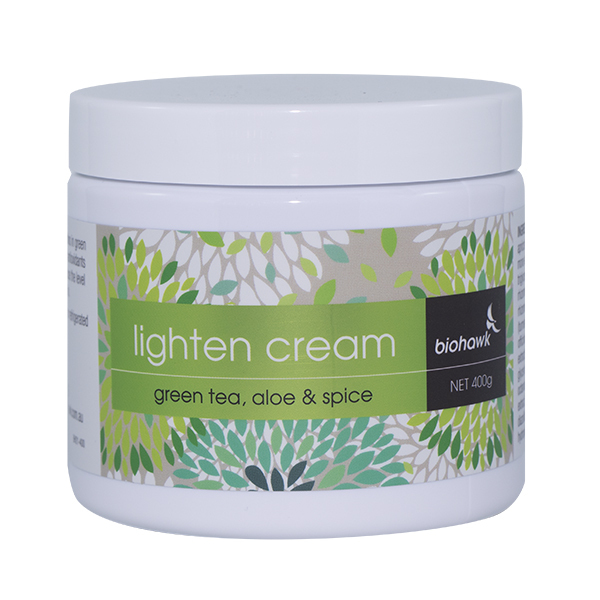 The antioxidant catechins in green tea in combination with the range of antioxidants in the gingers have the ability to reduce the level of melanin in skin to ‘lighten’ the skin. Store sealed in a cool dark place or refrigerated to maintain natural activity. Ingredients: Aloe vera juice, apricot kernel oil, glyceryl mono-stearate, capric/caprylic triglycerides, dried Zingiberaceae rhizome extract (Alpinia galanga rhizome extract, Curcuma longa (turmeric) root extract, Zingiber officinale (ginger) rhizome extract),cetearyl alcohol, agar, glycerin, avocado oil, cetearyl octanoate, ceteareth-20, green tea extract, D-panthenol, vitamin E, diazolidinylurea, fragrance, methyl hydroxybenzoate. Our soap is handmade with saponified extra virgin olive oil, fresh goat milk (with its protein allergens digested) and with Biohawk’s special blend of ginger and herbs to create a low allergy soap for sensitve skin. Ingredients: saponified extra virgin olive oil, fresh goat milk digested with Biohawk CaseoGo, Biohawk’s blend of ginger spices, passionflower herb dried and tea-tree powder. Note: allow bar to dry between use. Designed to pamper and soften your feet, and to soak your stress and aches away. Instructions: Add 2 cups luke warm water to a foot bath or small tub that can just accommodate your feet and then add 2 level tablespoons (16g) of Spicy Goat Foot Soak. Soak your feet and relax for 20 – 30 minutes. Pat your feet dry and massage in Biohawk Essential Balm. Ingredients: powdered goat milk, dry powder of blend of Zingiberaceae (ginger) spices, passionflower herb dried, tea tree powder.